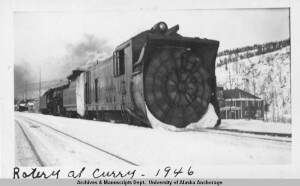 Locomotive with rotary snow clearing blade on the front at Curry, Alaska, 1946. UAA-hmc-0569-5c, Elmer Williams photographs, Archives & Special Collections, Consortium Library, University of Alaska Anchorage. Confluence: Proceedings of the Alaska Historical Society Annual Conference, Haines, September 25-28, 2013. Alaska on the World Stage: Proceedings of the Alaska Historical Society Annual Conference, Sitka, October 10-13, 2012. Northern Waters: Proceedings of the Alaska Historical Society Annual Conference, Valdez, September 21-24, 2011. Energizing Alaska: Proceedings of the Alaska Historical Society Annual Conference, Fairbanks, September 15-18, 2010. Encounters: Where East Meets West: Proceedings of the Alaska Historical Society Annual Conference, Unalaska, –2009. Alaska Visionaries: Seekers, Leaders and Dreamers: Proceedings of the Alaska Historical Society Annual Conference, Anchorage, October 16-18, 2008. Leading the Way: Statesmanship in Alaska: Proceedings of the Alaska Historical Society Annual Conference, Anchorage, September 15-18, 2004. Imagery and Popular Culture in Alaska: Proceedings of the Alaska Historical Society Annual Conference, Haines, September 23-27, 2003. Historic Interior Alaska: Proceedings of the Alaska Historical Society Annual Conference, Fairbanks, September 18-21, 2002. Prince William Sound in Alaska’s Past: Proceedings of the Alaska Historical Society Annual Conference, Valdez, September 26-29, 2001. Alaska at the Turn of Two Centuries and Historic Southern Southeast Alaska: Proceedings of the Alaska Historical Society Annual Meeting, October 6-9, 2000. Our Stories: Voices From Alaska’s Museums and Historical Societies: Proceedings of the Alaska Historical Society Annual Meeting, October 4-6, 1999. Migration in Alaska’s Past and History on High, Mountains in Alaska’s Past: Papers Presented at the Annual Meeting of the Alaska Historical Society, Palmer, September 23-25, 1998. Communities in Transition: Papers Given at the 29th Alaska Historical Society Conference, Sitka, October 19-21, 1997. Preserving and Interpreting Cultural Heritage: Papers Given at the Annual Meeting of the Alaska Historical Society, Anchorage, Alaska, October 9-12, 1996. Politics and Government in Alaska’s Past: Papers Presented at the Annual Meeting of the Alaska Historical Society, Juneau, Alaska, October 4-7, 1995. Trade and Commerce in Alaska’s Past: Papers Presented at the Annual Meeting of the Alaska Historical Society, Kodiak, Alaska, November 3-5, 1994. The Yukon River in Alaska’s History: Papers Presented at the Annual Meeting of the Alaska Historical Society, Fairbanks, Alaska, October 7-9, 1993. Canadian and American Perspectives on the North: Papers Presented at the Annual Meeting of the Alaska Historical Society, Haines, Alaska, October 22-26, 1991. Science and Technology in Alaska’s Past. Papers Presented at the Annual Meeting of the Alaska Historical Society, Anchorage, Alaska, November 29-December 2, 1990. Chang, Tohsook P., comp. Alaska’s Past. An Index to the Conference Proceedings. Anchorage: The Society, 1986. $0.50 (paper); AHS members $0.50.